Fourth Row Center: Film Writings by Jason Bailey: On DVD: "Mary and Max"
Adam Elliot’s Mary and Max is an unexpected oddity: a feature-length claymation film (or “clayography,” as the director calls it) with the dark humor and biting edge of a 1970s relationship movie like Harold and Maude or Thieves Like Us. Narrated by Barry Humphries (aka “Dame Edna”) and featuring the voice talents of Philip Seymour Hoffman, Toni Collette, and Eric Bana (among others), it is an absolutely charming and impeccably funny little gem. Our story begins in 1976 in Australia, where little Mary Daisy Dinkle (voiced by Bethany Whitmore as a girl, Collette as a woman) lives a lonely, friendless life. One day, in desperation, she grabs an address from the New York City telephone directory at her local post office and sends a letter to a random man—Max Jerry Horovitz (Hoffman). Max, overweight and also lonely, responds to her correspondence, and the two become pen pals, their relationship blossoming over the ensuing decades as both experience real pain, sadness, and loss. 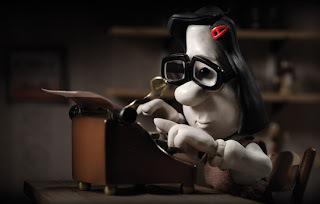 If it sounds less cheery than your average claymation film, well, it is; Mary and Max is a dark, often downbeat tale (particularly near its end), and is certainly not for young kids. But it is by no means a depressing picture—it’s full of uproarious non-sequiturs and funny visual gags (when Max finishes cutting his toenails, we see a trio of jars on his counter: “Toenails 1976,” “Toenails 1977,” and “Toenails 1978”), as well as Humpries’ witty voice-over (of Max, he notes, “flirting was as foreign to him as jogging”). The look of the film is just splendid, the painstaking consummation of five years of work by Elliot and his crew, assembling over 132,000 individual frames of stop-motion animation to give the movie its haunting, moody texture. Elliot contrasts the bright colors of Mary’s home in Australia with Max’s desaturated New York, in which the only splashes of color are provided by the gifts sent to him by his faraway friend. Movement is smooth but stylized, while the liquids (Max’s sweat and Mary’s tears in particular) are especially fun to watch. The voice characterizations are also quite wonderful; Bana is charmingly roguish, while Collette and Whitmore bring sweet little Mary to sympathetic life (though, contrary to the billing, there’s less of Collette than there is of Whitmore or Hoffman). The centerpiece of the film is Hoffman’s brilliant vocal performance; his readings, always slightly out of breath and with a soft Jewish growl, put a spin on the already-clever lines, creating a character that is alternately lovable and absolutely impossible. Though it is occasionally interrupted, the overall structure and format of the screenplay (their letters back and forth) does get a bit tiresome—as anyone who’s sat through a community theatre production of Love Letters will tell you—and the narration is a little overbearing, particularly in the first half hour or so. But overall, Mary and Max is just enchanting—funny, poignant, and rather sad and beautiful. "Mary and Max" hits DVD and Blu-ray on Tuesday, June 15th.